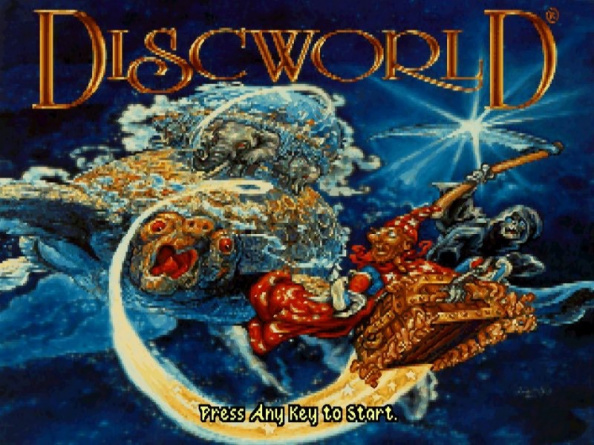 Discworld Classic Point and Click Adventure – Did You Get the Number of that Donkey Cart? In a secondhand set of dimensions. In an astral plane that was never meant to fly. Somewhere in darkest Ankh-Morpork, a sinister plot is about to unfold. Discworld, also known as Discworld: The Trouble With Dragons released in 1995 featuring Rincewind the wizard (voiced by Eric Idle from Monty Python’s Flying Circus). Rincewind with his attractive red dress, sorry I mean wizard robes, is entrusted with the daunting task of removing a huge fire breathing dragon that has been terrorising the citizens of the colourful and completely bonkers city of Ankh-Morpork, which is based on the renowned comedic fantasy books by Terry Pratchett. Discworld is not your typical dreary round planet, instead it is a completely flat world balanced on the backs of four elephants which in turn stand on the back of a gigantic turtle. Sound crazy? Well this is just the start of the lunacy you can enjoy in Discworld and you will be greatly rewarded for your patience and admiration due to the twisted plots and amusing antics. Eric Idle is not the only voice you will recognise, with other vocal talents including Tony Robinson (Time Team presenter and “I have a cunning plan!” – Baldrick from Black Adder), Jon Pertwee (Worzel Gummidge and Doctor Who) and Rob Brydon (“two words, Sat Nav!” – Bryn West from Gavin and Stacey). …curiosity not only kills the cat, but ties lead weights to its feet and throws it in the river! As you watch the introduction to the game, an insect (or a fly on the wall you might say) follows the action until it finally becomes your cursor on the screen. This magical transformation is just the start of these quirky moments within Discworld as you then realise your luggage sleeping on top of the wardrobe, yes that is right… sleeping. This will soon become your inventory, but first you must grab a broom from downstairs to prod him to a more woken and productive state. Your strolling inventory will then act as your silent companion around the game, with its little legs scuttling alongside Rincewind providing ample storage for the collecting of the weird and the wonderful. Rincewind and other members of the same recognisable profession reside in Unseen University. Consider it to be a place full of mature students who live life to the full by doing very little and who are more than comfortable employing a monkey as a librarian, just make sure you are equipped with a banana and the wisdom not to highlight his particular hairy ancestry, unless you fancy a headache for your troubles. Wizards have the honour, albeit a dubious one, of being claimed personally by death. Not only that, but wizards can actually see and talk with Death. Despite rumours to the contrary, he is not a cheery dinner companion. You will meet many inhabitants along the way including Death, whose job is to gather souls and deliver punchlines, while also as a courtesy offering a chilling reminder to Rincewind that he shouldn’t read any long books. Chucky Chucky Chucky… the jester’s companion who will torment you with his likeness to all things resembling insanity and of course not forgetting the all important palace guards, whose culinary delights include chocolate cake, strawberry pudding and duck’s foot casserole with leaf mould…oh sorry did I say leaf mould? I meant caramel! hmmm yum. The very first time I came close to completing this title, I hit one unfortunate snag. On the very last scene the game failed to advance to the next section and no matter what I did to interact with the characters, nothing happened. After hours of difficult thinking I had to put it down to bad luck, but Discworld did have a bit of a history with a few bugs here and there and even with the aid of a decent walkthrough, nothing could have prepared me for this. Discworld also had the distinctive attribute which has since become famous by including the ‘F bomb’. Although it was meant to be hidden, it was revealed for one individual because of yet another bug! Discworld is one of the hardest point and click adventures you could ever experience, with its sometimes illogical puzzles and mystifying progression, however it is also one of the most entertaining due to the humour provided by Rincewind and his fellow chuckle-worthy cast of misfits and sinister authorities. Featuring beautifully hand drawn backgrounds, amazing voice acting and plenty of challenges for even the most seasoned point and click adventurer, Discworld is a must for any fan of the genre. My love for the game doesn’t end there though as I have enhanced the music from Discworld for use within ScummVM. My Discworld Enhanced Soundtrack Version 2.0 Released in August 2009 with permission granted directly from the author Terry Pratchett. Discworld is compatible with ScummVM and hopefully one day soon, you will be able to ‘legally’ download the full game, as it is planned to be released with freeware status, once some of the legalities have been rectified. Next → Lexmark Platinum Pro905 All-in-One Inkjet – Why Be Skint? A Penny A Print!